Skullcap, or scullcap, tomatoe or tomato? Isn’t it interesting that this member of the mint family, which contains approximately 300 species, can be found spelled either way with a c, or a k? Even the herb companies have taken sides. For example: Herb Pharm spells their product Skullcap, while Nature’s Way spells it Scullcap. Somewhat confusing I know when you also consider that spell check doesn’t like scullcap spelled with a c, i.e. “not found in dictionary.” No matter how you choose to spell scullcap, the plant I will be talking about is the botanical, Scutellaria lateriflora. Since its name derives from the Latin scutella, meaning “a small dish” and referring to the shape of the flower, I prefer to use the spelling closest to the genus name of this plant. Let’s keep it simple. And that is how I prefer to use scullcap, as a simple. What that means is that I like to use one herb at a time, when appropriate, because that way I don’t have to wonder which herb is working or which one is not. Besides, you can only put so many herbs in your body at one time (like food) so why confuse it with a smorgasbord or dilute it by adding too many. I also believe that healing takes place in the context of relationship, so using one herb at a time allows for a deeper intimacy with that plant and helps to build trust. 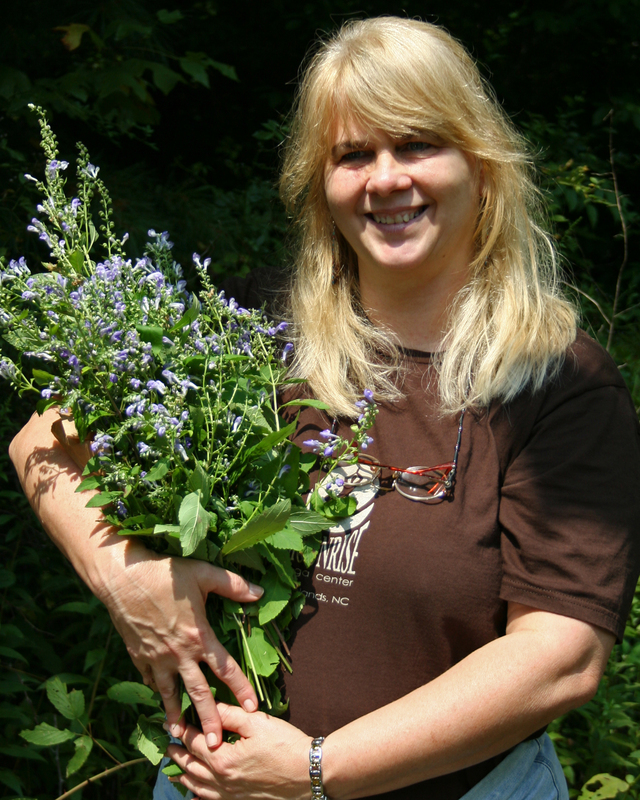 I live in the Appalachian Mountains of Western North Carolina and for that reason I am particularly interested in plants growing in this region. 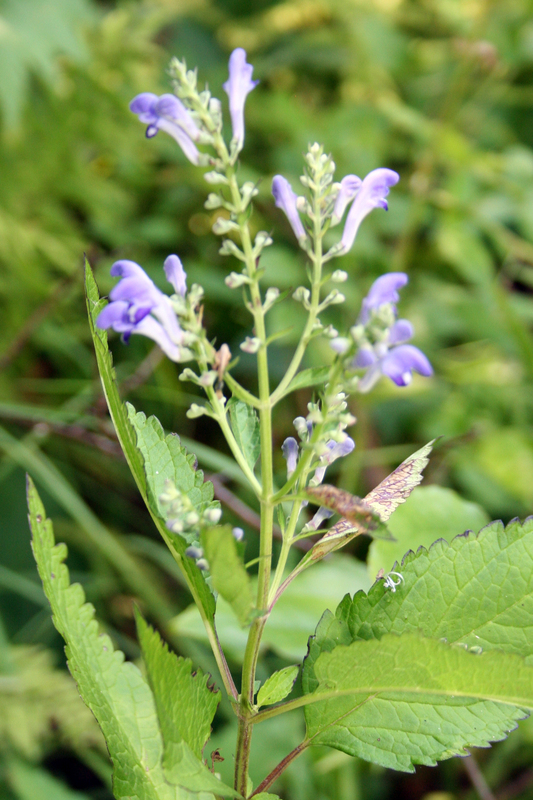 Scullcap is one of these and a North American native highly valued by the Cherokee who use it as a nerve tonic and sedative. It likes to grow along the sunny edges of damp meadows near small bodies of water and is a perennial that thrives in the moist eastern woodlands. Small pale blue or violet blue flowers are not long lived and bloom in the summer between June and September. These flowers are in one-sided racemes from the leaf axils, which makes scullcap easier to identify. The aerial parts are best tinctured fresh when in full bloom. My personal encounters with scullcap have been most rewarding. Gathering it in and of itself is a blissful occupation. I have made and used fresh scullcap tincture for both myself (nervous exhaustion) and with clients. One scullcap success story resulted when a mother brought her 9-year-old son to me for a consultation regarding his bedwetting. Let’s call him Jimmy. Jimmy had been sleepwalking, bedwetting and having night terrors for as long as his parents could remember. They had recently adopted another child (from China) and were consumed with caring for this new family member with special needs and no longer wanted to be up in the middle of the night with Jimmy. Besides, they were genuinely frightened and concerned for his safety and well-being when they would find him walking around in the middle of night while completely asleep. Jimmy did not know what was happening and woke in the morning with no recall. He was also diagnosed in school with ADD. I recommended scullcap tincture in the morning and evening along with some dietary changes (no wheat and dairy) and asked his mother to follow up with me in one month. At one month I tried contacting the mother but she never got back to me. A few months later I ran into them at a social gathering and asked how Jimmy was doing. “Oh, great!” She said, and went on to tell me about all the exciting things they had been up to. What I realized was that she had simply gotten on with her life and not looked back. Then she told me that they had been unable to make any dietary changes, but that Jimmy had started to improve almost immediately with the scullcap. Amazing. On another occasion a friend of mine’s daughter called frantic with a 9-month old baby who wasn’t sleeping and woke hysterically crying every night and had a hard time getting back to sleep. This had been going on for 3 months and the parents were exhausted. They had tried everything; more food to settle her stomach (maybe she was hungry? ), different food, chamomile tea, homeopathic remedies, and they had ruled out teething and been checked out by the pediatrician. You know what worked? Scullcap: 5 drops of alcohol tincture up to 3 X a day. The beauty of scullcap is that it is a tonic that can be used long term and is not addicting. 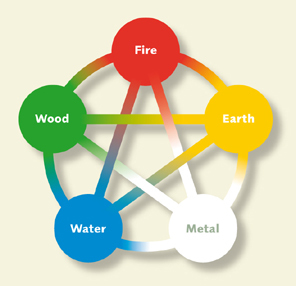 The other thing I learned from the perspective of Traditional Chinese Medicine and Five Element Theory is that scullcap is a cooling bitter herb that calms the mind and restores the shen to the heart (Fire Element). In TCM the mind is seen as referring to the heart and in this context shen corresponds to mind and consciousness with the process of thinking being accomplished by the heart. One of the hearts main duties is to store the shen, which describes spirit, or the animating force of life. Shen has been translated from the Chinese as both “mind” and “spirit.” As the integrator of consciousness and perception, the shen unites the disparate aspects of the self. When the shen is restless for any reason, as we have seen in the examples above, scullcap has the amazing ability to restore the shen. We may call this restlessness nervous anxiety or nervous tension, but the nervous system is what carries the electrical impulses generated by the brain and heart. Heart-Mind in TCM corresponds with the Fire Element and the Summer season. The benefits of scullcap to reduce nervousness and treat insomnia by quieting the spirit or shen and helping it to stay centered in the heart cannot be over estimated. Summer is the perfect time to be introduced to scullcap in her season of bloom, so I invite you to bring her into your life in whatever manner you may choose and get to know her, for her gift is great. When the heart is serene, pain seems negligible. – Inner Classic. Can also be tinctured fresh using Vodka in the folk tradition.